The Centre for Culture, Ethnicity & Health (CEH) have updated their Language Services Information Sheets, in response to sector demand and developments in language service policy. 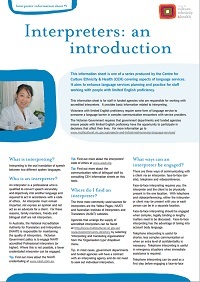 These information sheets provide useful information on how to effectively engage with language services and are designed to support and encourage all agencies, no matter how established or confident they are in their practices, to aim for continuous improvement in their provision of language services. Tip: Information Sheets are located at the end of the CEH webpage.